man that guy is swollen..what do you think shellfish allergy? If you ask some folks about muscle function they may start pointing and naming off the ones that they’re proud of and that’s if they haven’t already sent you pictures of their P90X abs in front of the bathroom mirror with their camera phone set to stun. If you’re like me, you’ll point to the ones you badly need to take to the shop (gym) for repair. However, we’re not here today to play pin the tail on the gluteus maximus. No my friends, in order to give muscle function the attention it deserves we need to get deep and real on the microscopic level..up close and very personal. Cue super hi-tech, magnified computer graphic model! Oh wait, I’m not actually funded. Well check out this boring 1970’s model below…just as good. 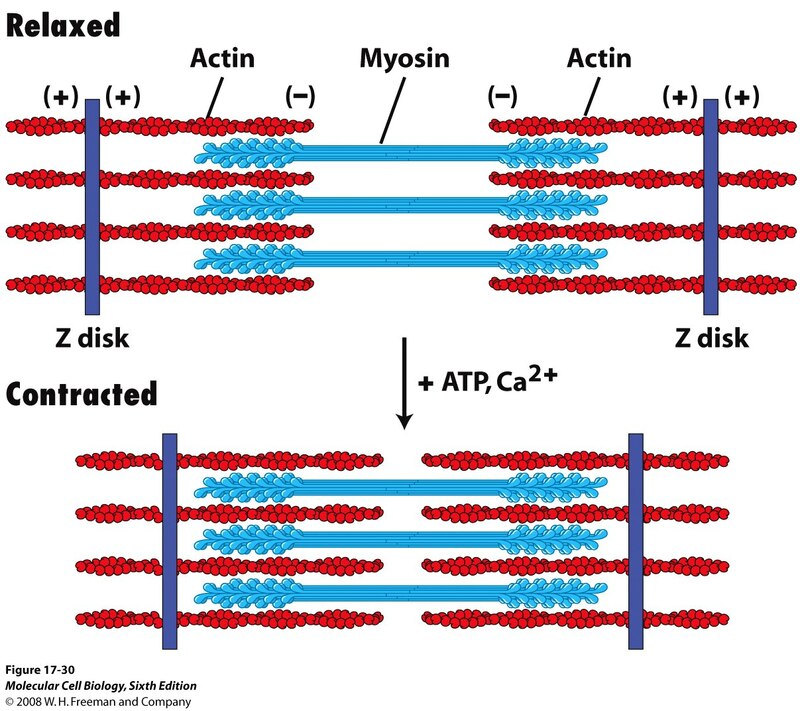 When I say “muscle” and I look at this diagram below, that looks not unlike a mattress box spring, my first thoughts are “what the hell is…” A single skeletal muscle is a lot like Kanye West, layered and complex. No worries, we’ll get back to this picture in a bit and hopefully it will make a lot more sense and if not well….maybe you shouldn’t put so much pressure on people. I mean do you have to stand so close? Muscle (let’s say bisceps) composed of bundles of fascicles encased in a protective perimysium coat. 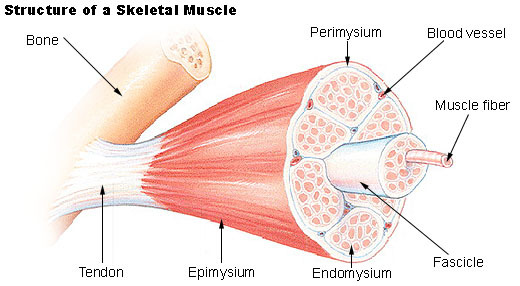 Those fascicles are composed of bundles of muscle fibers (myocytes) which are cells encased in their own protective edomysium coat composed of collagen – by the way, collagen is one of the things people suffering from scurvy (vitamin C deficiency) have trouble making. Ok, that’s the last I’ll mention the gross anatomy because we need to get down to the business of the myocytes. That’s really where the action is. Individual muscle cells (myocytes if you’re nasty – Janet Jackson reference) are made up of myofibrils which are bundles of protein. Oh man, are you getting tired of bundles yet…when does it end? Never. Here’s where it get’s fun because now we’re on the cellular level and you know I like it when we get cellular. Muscle cells are composed of myofibrils each one is a curious jigsaw of proteins that slide past each other at specific, fine tuned junctions that collectively result in muscle contraction and relaxation. That’s right the deeper you go down the simpler everything is…just consider that at it’s core the source of a muscle’s movement is the sliding of proteins. and once more with feeling..